Hi friends, how are you all?? Hope all must be busy with Christmas celebrations… My weekend was very surprise and super happy with my sister’s surprise visit. We had a good time together. 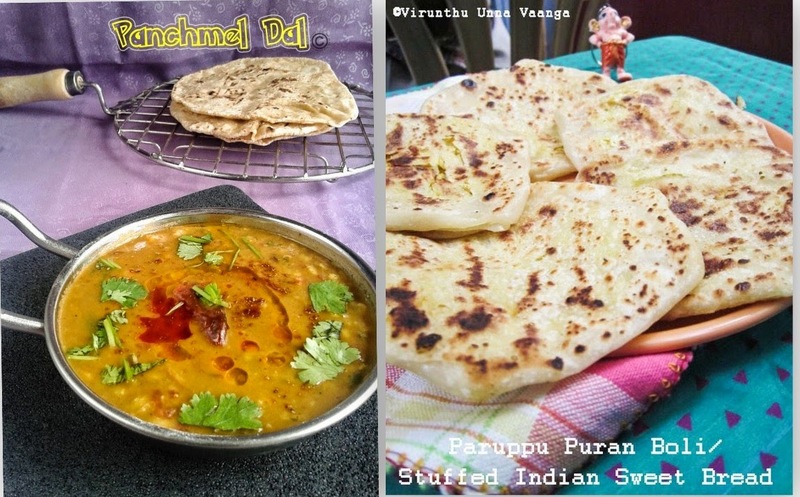 I prepared strawberry thumbprint cookies, peanut butter cookies, peanut mawa ladoo for them. They really enjoyed all and I packed it and sent for our lil angel. I was prepared the masala crackers on Thursday evening and packed it for next day to take photographs. 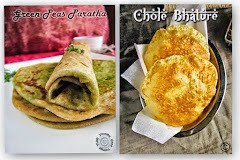 But due to my sis’s surprise visit, am totally forgot the crackers, then today morning unexpectedly I have seen the crackers box, and then only I took photographs and now posted here. 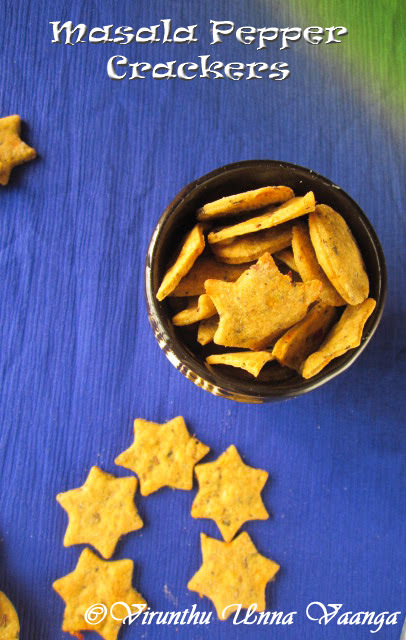 I prepared the crackers from +Divya's Space, but I added besan flour and oregano with the original recipe but it really come out very well. 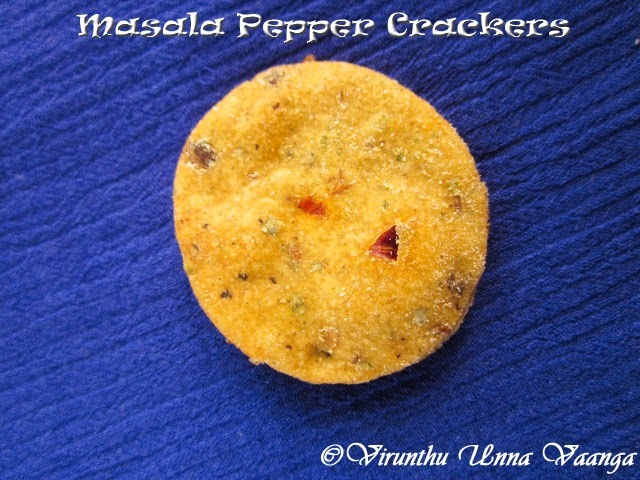 The cracker was quite dominating with pepper flavor, so I named it as Masala Pepper Crackers… It’s very easy to prepare and perfect low calorie snack for winter time. I really enjoyed every bite of the crackers. 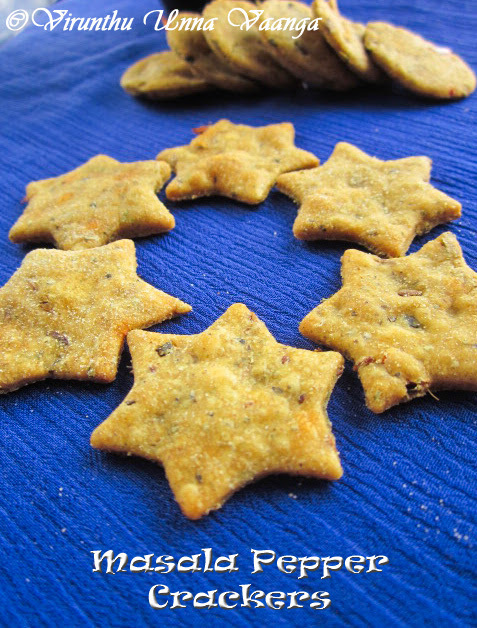 Its really guilt free snack which was prepared in whole wheat flour and with spices, so you can taste it anytime and I already prepared biscuits with whole wheat flour. Dry roast the cumin seeds, red chillies, dry curry leaves, oregano, pepper corns for 2 minutes on low flame or till the aroma comes. 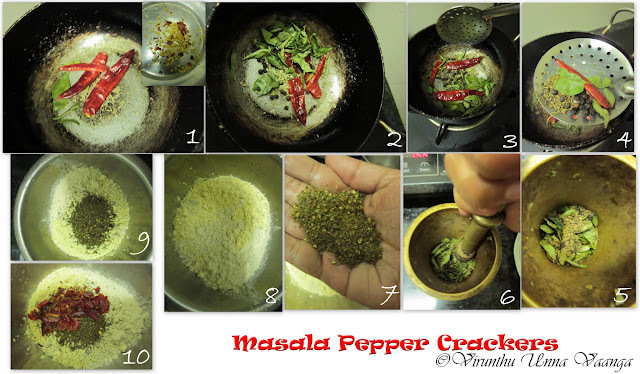 Cool it completely and make coarse powder using mortar and pestle or in mixie grinder. 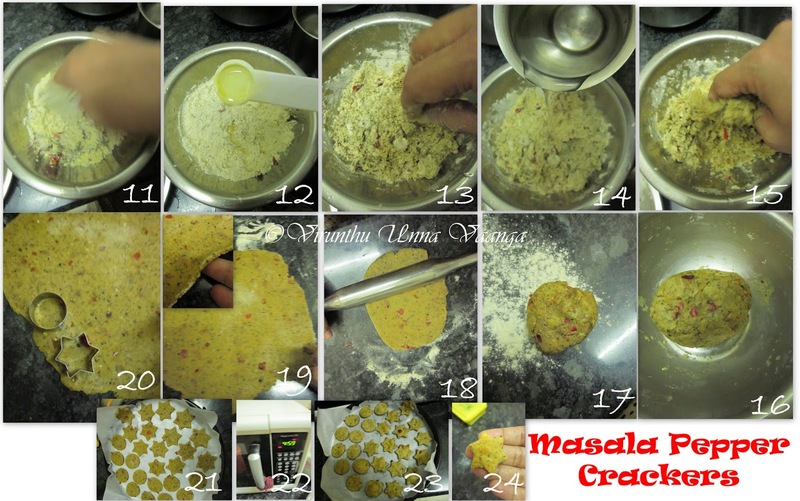 Now take a wide bowl, add whole wheat flour, besan flour with salt and mix it, till combines well. Add the ground spices mix it well, then add oil and mix it well, it looks like crumble. 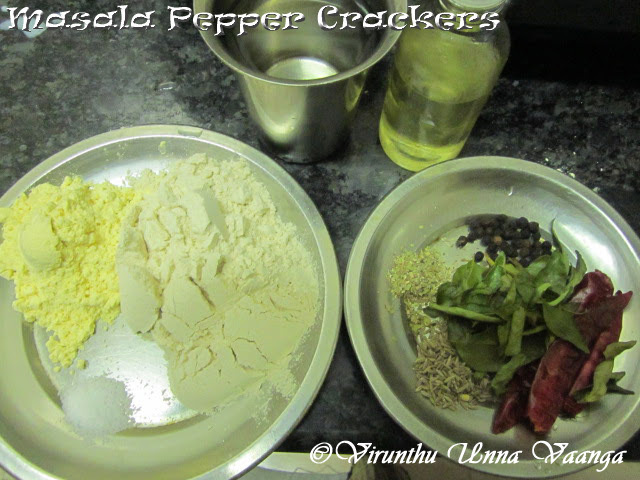 Now add enough warm water to knead the flour into chapathi dough consistency. Cover with damp cloth for 15 minutes. Now divide the dough into 2 equal balls then keep it in flour spread counter top. Preheat the oven at 200° C/392 F.
Roll it using chapathi roller into thin sheet. Cut with cookies cutter (I used Star and Round shape cookie cutter) and carefully separate it and keep it in parchment paper which layered in baking tray. Bake it for 5-7 minutes (depends upon the thickness of the dough) and cool it completely. Keep looking the oven whether the cookies are get ready or not, else it will burn quickly. 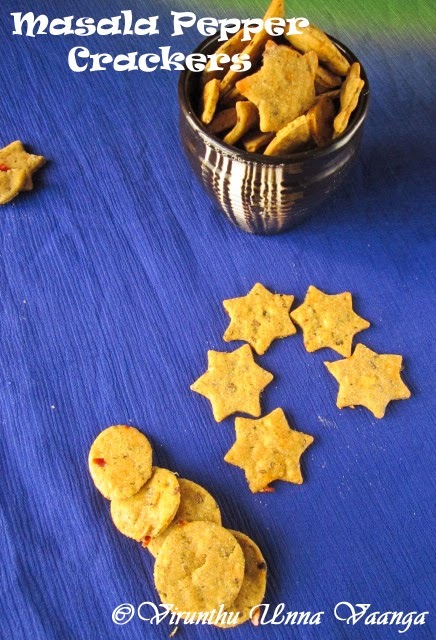 Make very thin sheets to get crispier crackers. 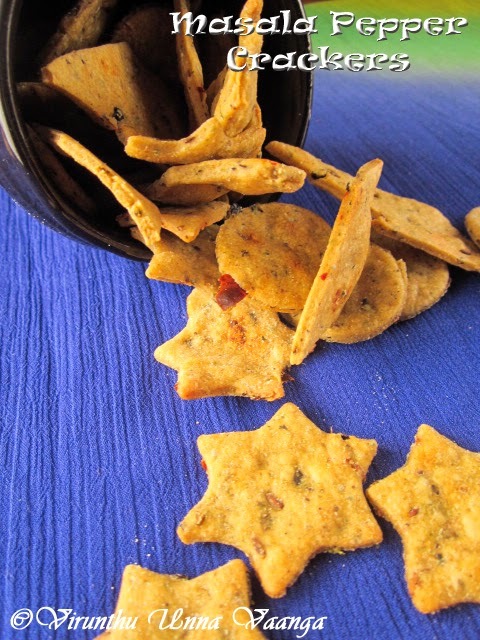 ENJOY THE CRISPY AND SPICY CRACKERS!!! 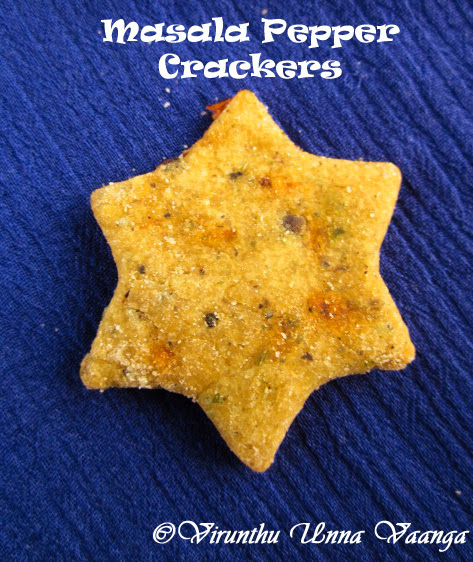 Crackers look really yummy. Awesome pics! 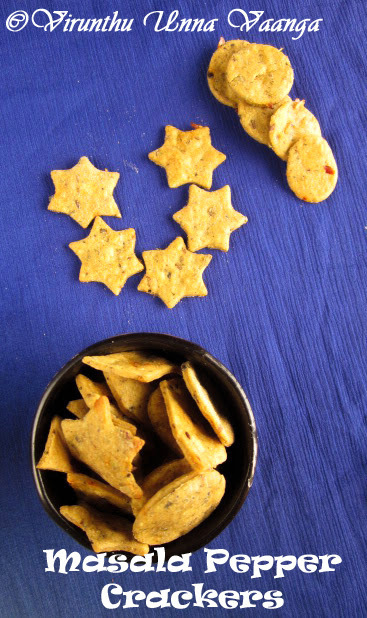 Crispy and tasty snack. So perfectly baked. 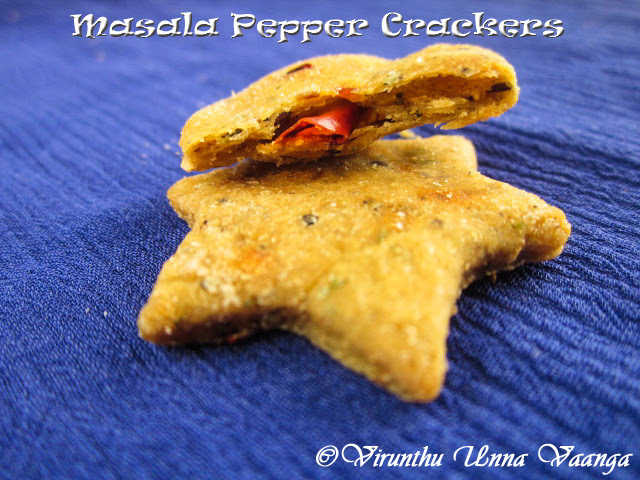 Love this masala crackers viji .WE can really see the chili flakes inside ..
Yum! 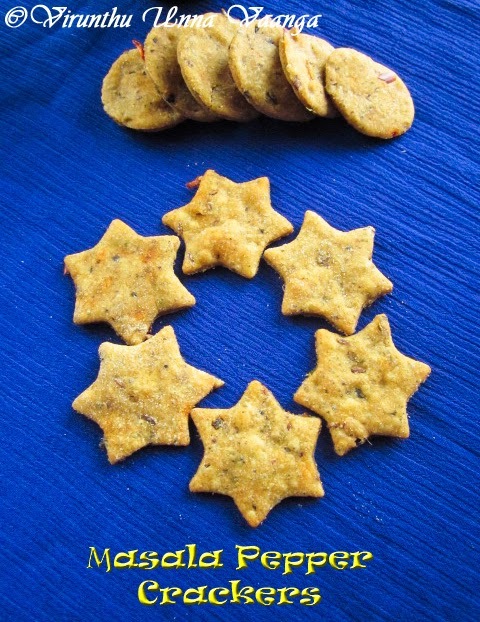 I will definitely make these crackers! We always make 'nuts and bolts' at Christmas time, but these look equally good. I think we'll have to have both! 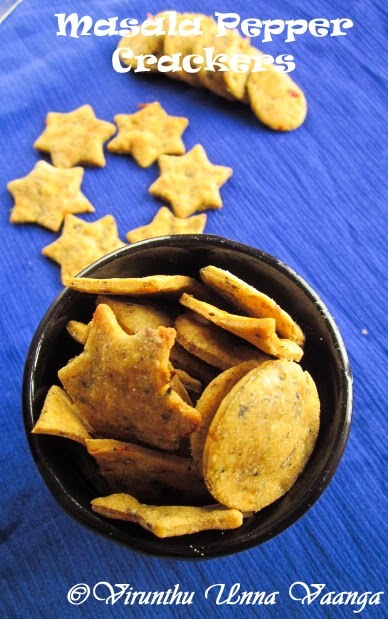 Crackers luking spicy n crunchy ...need sum tea fr evng snack.lovley..